This entry was posted in episodes and tagged blaq poet, cesar comanche, chester copperpot, dj premier, edgar allen floe, episodes, ev productions, ike eyes, jah safe, longshot, milano, mixtapes, purple city, respect, romello hill, smif n wessun, year round records by dex digital. Bookmark the permalink. 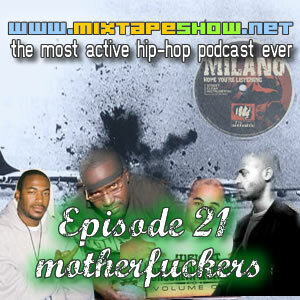 Its a very unique experience listening to this mixtape show 21, and still feeling a people trying to deliver upliftments in a manner that assertains to the deliverer being constructive and instructive also. In fewer Words…Glad to be On Board! This WHOLE episode is TIGHT. Especially: Longshot feat Jah Safe & Romello Hill- Quitters Anthem…I play this track to death along with that Ike Eyes joint! Wow, throwback episode. Yeah, Ike Eyes definitely has some hot material, but I haven’t really heard from him in a minute..